Intellectual property refers to the inventions, symbols, names and images used by organizations, and other properties such as artistic works. Intellectual property software enables user and organizations to effectively and efficiently manage and protect their intellectual properties. In addition, intellectual property software also helps to gain and maintain patents, trademarks, licenses, rights and others such as agreements across the intellectual property lifecycle. 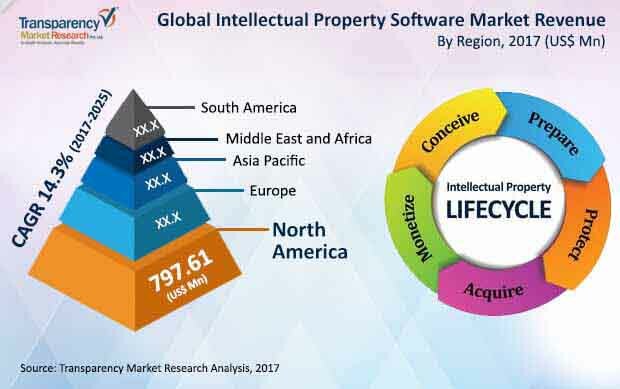 According to the research report, the global intellectual property software market is expected to be worth US$6,758.4 mn by the end of 2025. During the forecast period of 2017 and 2025, the global market is estimated to surge at a CAGR of 14.3%. Intellectual property software market is segmented by component, application, and end-use industry. By component, global intellectual property software market is categorized into software, and services. Among these components, software segment is further segmented into cloud-based and on premise. Furthermore, services segment is categorized into development and implementation services, consulting services, and maintenance & support services. Among these services, maintenance & support services segment is anticipated to see flourishing growth during the forecast period. This is primarily due to rising adoption of intellectual property software across multiple end-use industries especially manufacturing, healthcare, and IT & telecommunication. Whereas cloud-based segment is expected to see increasing adoption, owning to the factor such as transition of businesses to paperless or cloud-based business models. Based on applications, global intellectual property software market is categorized into patent management, trademark management, intellectual property portfolio management, intellectual property licensing, intellectual property reporting & analytics, and others. Intellectual property licensing, reporting, & analytics segments are projected to see healthy growth during the forecast period. On the basis of end-use industry, intellectual property software market is segmented into individuals (independent inventors), banking, financial institutions, and insurance (BFSI), government, healthcare, IT and telecommunication, electronics, manufacturing, and others. Among these, healthcare, IT & telecommunication, and electronics are the key industries supplementing the growth of intellectual property software market. Geographically, the global market is segmented into North America, Europe, the Middle East and Africa, Asia Pacific, and South America. North America held the largest share in the global market for intellectual property software market as of 2015. The high rate of patenting has been the driving force for this market in the last few years. Growing application and awareness of intellectual property rights amongst end-use industries has also benefitted the overall market. The report states that emergence of information and communication technologies is also likely to contribute towards the growth of this regional market in the forthcoming years. On the other hand, Asia Pacific is also expected to show an excellent growth rate as the region is on the verge of an economic revolution with emergence of a banking and finance sector. The emerging economies of India, China, and Indonesia are expected to be the key contributors to the intellectual property software market. The rising penetration of intellectual property software has encouraged many regional and global companies to extend their product portfolio across the world. Among these companies, some of the major players in global intellectual property software market are Aistemos, Ambercite, Anaqua, Inc., Clarivate Analytics, Dennemeyer, Evalueserve Netherlands B.V., Gemalto NV, Gridlogics, Innography, Inc., Innovation Asset Group, Inc., Inteum Company, LLC, Iolite Softwares Inc., IP Checkups, Inc., IP Street Holdings, LLC, IPfolio, LexisNexis, Minesoft Ltd., O P Solutions, Inc., Patrix AB, PatSnap Pte. Ltd., Questel, TORViC Technologies, Inc., VajraSoft Inc., Wellspring Worldwide, and XLPAT. This report provides an analysis of the global intellectual property software market for the period from 2017 to 2025, wherein the period from 2017 to 2025 comprises the forecast period and 2016 is the base year. Data for 2015 is provided as historical information. The report covers all the major trends and technologies playing a major role in the growth of the intellectual property software market over the forecast period. It also highlights various drivers, restraints, and opportunities expected to influence the market’s growth during this period. The study provides a holistic perspective on the market’s growth in terms of revenue in US$ Mn, across different geographical regions namely North America, Europe, Asia Pacific, Middle East & Africa and South America. Intellectual property software enables user to protect and develop a brand or assets and keep their work private, protected and confidential. At present, end-users have robust tradition of protecting their creative and innovative works such as music and authorship of books and paintings, through intellectual property rights. The enforcement of intellectual property rights have the capability to underpin the sustainability, rise, and growth of new business models. Growing adoption of intellectual property software especially in mature markets such as Europe and North America to protect IP assets are expected to boost the demand for intellectual property software in coming years. In addition, growing awareness among end-users in order to transfer, acquire, and protect intellectual capital is expected to contribute in the growth of intellectual property software, especially in developing regions such as Asia Pacific, MEA and South America. The market overview section of the report showcases the market dynamics and trends such as the drivers, restraints, and opportunities that influence the current nature and future status of this market. The report also provides the ecosystem analysis and key market indicators for the intellectual property software market. The intellectual property software market data estimates are the result of our in-depth secondary research, primary interviews and in-house expert panel reviews. These market estimates have been analyzed by taking into account the impact of different political, social, economic, technological, and legal factors along with the current market dynamics affecting the market growth. Apart from this, the report also comprises product overview which include product positioning and consumer analysis for the intellectual property software. The global intellectual property software market is segmented on the basis of component, application and end-use industry. By component, the global intellectual property software market is bifurcated into software and services. The market for software segment is further cross-segmented into cloud-based and on-premise. Whilst, the services segment is further cross-segmented into development & implementation services, consulting services and maintenance & support services. On the basis of application, the global intellectual property software market is segmented into patent management, trademark management, intellectual property (IP) portfolio management, intellectual property (IP) licensing, intellectual property (IP) reporting & analytics and others. Further, the end-use industry segmentation includes individuals (independent inventors) and enterprises. The enterprise segment is further cross-segmented into banking, financial institutions, and insurance (BFSI), government, healthcare, IT & telecommunication, electronics, manufacturing and others. The report covers the analysis of these segments across all geographies, along with qualitative analysis for key market indicators supplementing the growth of intellectual property software market during the forecast period. The report also includes competitive profiling of the key players associated with the intellectual property software market around the globe. The important business strategies adopted by them, their market positioning, financials, SWOT analysis, and recent developments have also been identified in the research report. The competitive landscape section of the report also gives an overview about the major contributing regions/countries by these key players in order to strengthen their market position in the future. Rising demand for intellectual property software and increasing focus on protecting tangible and intangible assets, forcing companies to develop advanced intellectual property software to continue the profitability of the market. Aistemos, Ambercite, Anaqua, Inc., Clarivate Analytics, Dennemeyer, Evalueserve Netherlands B.V., Gemalto NV, Gridlogics, Innography, Inc., Innovation Asset Group, Inc., Inteum Company, LLC, Iolite Softwares Inc., IP Checkups, Inc., IP Street Holdings, LLC, IPfolio, LexisNexis, Minesoft Ltd.,O P Solutions, Inc., Patrix AB, PatSnap Pte. Ltd., Questel, TORViC Technologies, Inc., VajraSoft Inc., Wellspring Worldwide and XLPAT, are the few key players which have been profiled in this study. Details such as financials, business strategies, SWOT analysis, recent developments, and other such strategic information pertaining to these players has been duly provided as part of company profiling.